Sometimes it just pays to be patient. This plant has been through the mill. Its one of those "Low Light" orchids that people get up North because they don't have enough light to grow anything "fancier". They're beautiful in their own right, but they do have particular needs that growing in Florida outdoors may not provide. 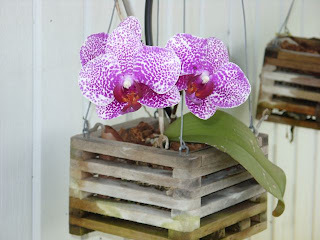 Phalaenopsis or Moth Orchids prefer cooler temperatures, shade or indirect light, and moderate humidity. By cooler, I mean not hot house conditions. I had a plant in Philadelphia in my living room that grew in a window all year around. That was an old window, pre War, maybe even from the 1800s, and was very leaky single pane glass. It got direct sunlight for all of about an hour a day. That plant would bloom 11 months out of the year, only dropping its flowers in August. This particular plant was growing beside the house, under a roof that got very hot. It moped along and never really did anything there, and started to drop leaves. When it got down to one leaf, I moved it out to the shed. That place is where you see it above, its about 10 degrees cooler and the result is that it is blooming now. In fact the first thing the plant did was to send up a "flower spike" and went into bloom before it even begun to put out more leaves. At this point it's very happy, blooming away and has another 3 leaves. You can only "Bloom Where you are Planted" if you have what you need to bloom. Sometimes you just need a little help. So pretty-I love the color!! !